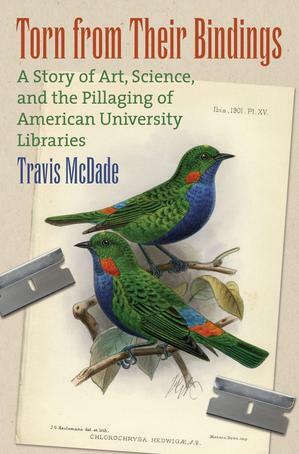 With all the news about book theft of late (in Pittsburgh; and Dayton), and a nationally screened film about the 2004 robbery of Audubon’s Birds of America in Kentucky, it may seem as though Travis McDade’s new book, Torn from Their Bindings: The Story of Art, Science, and the Pillaging of American University Libraries, was ripped from the headlines. Sadly, the truth is that not-so-clever book thieves are always with us, as borne out in his meticulously researched page-turner that focuses on the case of Robert Kindred, who sliced thousands of antique prints out of rare books and journals in 1980. McDade is the author of several books about book theft, including Thieves of Book Row: New York’s Most Notorious Rare Book Ring (2013), excerpted in our spring 2013 issue, and Disappearing Ink: The Insider, the FBI, and the Looting of the Kenyon College Library (2015). He is also the curator of law rare books at the University of Illinois College of Law, which is to say, he is the leading expert on rare book crimes. McDade’s approach is methodical as he tracks Kindred (driving a Cadillac, no less) from Southern California to Texas to Illinois, with a few stops in between, stopping at university libraries to pillage the stacks. It is the heist Kindred tries to pull off at the University of Illinois, and for which he got caught, in June of 1980, that McDade zeroes in on. Kindred and his accomplice, Richard Green, had attempted to steal several oversized illustrated books but were foiled when a maintenance man literally stumbled across their cache on his way into the building late one night. Turns out Kindred, a hustler with a string of bad ideas, is a character right out of fiction, and McDade harnesses that to tell a suspenseful tale and make a compelling argument about library security and preservation issues. Another of the useful takeaways of McDade’s true crime has little to do with crime or even books per se, but much to do with art, in the form of embedded mini biographies of illustrators Eaton, Bewick, and Thorburn, to name a few. The color plates by these illustrators depicting flora and fauna, from journals like Ibis and Proceedings of the Zoological Society of London, were Kindred’s main targets, as they were easily removed with a razor blade and rarely marked with ownership stamps. The difficulty of proving their provenance would work in his favor, and would ultimately hamper efforts to return much of the purloined art even years after the case closed. Ten years in the making, McDade has delivered a book that should be of great interest to bibliophiles everywhere, particularly those guardians of collections who too often have to deal with the likes of Kindred and his ilk. Book Review: \"Torn from Their Bindings\"
With all the news about book theft of late (in Pittsburgh; and Dayton), and a nationally screened film about the 2004 robbery of Audubon's Birds of America in Kentucky, it may seem as though Travis McDade's new book, Torn from Their Bindings: The Story of Art, Science, and the Pillaging of American University Libraries, was ripped from the headlines. Sadly, the truth is that not-so-clever book thieves are always with us, as borne out in his meticulously researched page-turner that focuses on the case of Robert Kindred, who sliced thousands of antique prints out of rare books and journals in 1980. McDade is the author of several books about book theft, including Thieves of Book Row: New York's Most Notorious Rare Book Ring (2013), excerpted in our spring 2013 issue, and Disappearing Ink: The Insider, the FBI, and the Looting of the Kenyon College Library (2015). He is also the curator of law rare books at the University of Illinois College of Law, which is to say, he is the leading expert on rare book crimes. McDade's approach is methodical as he tracks Kindred (driving a Cadillac, no less) from Southern California to Texas to Illinois, with a few stops in between, stopping at university libraries to pillage the stacks. It is the heist Kindred tries to pull off at the University of Illinois, and for which he got caught, in June of 1980, that McDade zeroes in on. Kindred and his accomplice, Richard Green, had attempted to steal several oversized illustrated books but were foiled when a maintenance man literally stumbled across their cache on his way into the building late one night. Turns out Kindred, a hustler with a string of bad ideas, is a character right out of fiction, and McDade harnesses that to tell a suspenseful tale and make a compelling argument about library security and preservation issues. Another of the useful takeaways of McDade's true crime has little to do with crime or even books per se, but much to do with art, in the form of embedded mini biographies of illustrators Eaton, Bewick, and Thorburn, to name a few. The color plates by these illustrators depicting flora and fauna, from journals like Ibis and Proceedings of the Zoological Society of London, were Kindred's main targets, as they were easily removed with a razor blade and rarely marked with ownership stamps. The difficulty of proving their provenance would work in his favor, and would ultimately hamper efforts to return much of the purloined art even years after the case closed.